Jeffersonville Mayor Mike Moore has established The Green Team which is comprised of city Parks Department employees. The Green Team is directed and managed by the city’s new Greenspace Manager, Jeremy Neff. “As you know, I love our parks and that is because The City of Jeffersonville has some of the most beautiful parks in the state of Indiana and they directly benefit our residents by improving the quality of life. Our parks and green spaces are a big part of what makes Jeffersonville so special. Our goal is to provide the highest level of care for our green spaces with the most effective use of taxpayer dollars. Now, we are able to both save money and improve our maintenance protocols of these important city assets,” said Mayor Moore. Mayor Moore continued, “The Green Team will focus all of their time on our beautiful parks and green spaces. We are very excited about this concept because it will really help our city save money and improve our services. We selected Jeremy as Greenspace Manager based on his extensive grounds management experience. He has a vision for the maintenance and beautification of our parks and he is already implementing changes that are needed. For example, we were paying $100,000 each year to a private landscaping company just to maintain the medians on 10th Street and now we are doing this work at what will be a significant, annual cost savings. 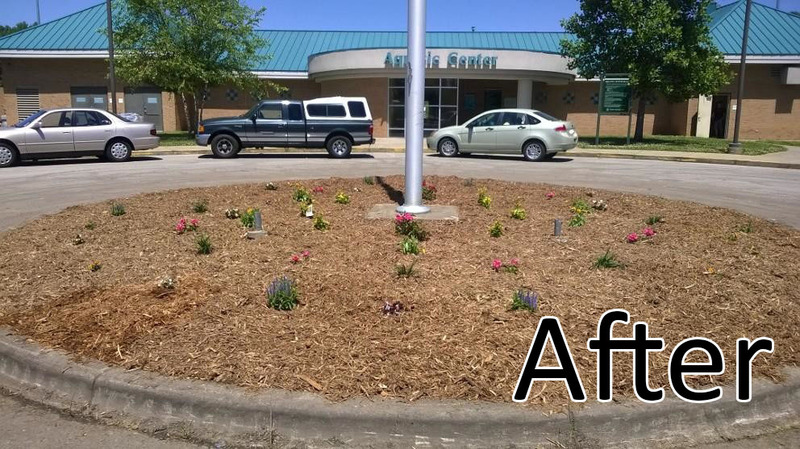 We are very grateful that the City Council approved the Green Team and the funding of the new positions,” said Mayor Moore. The Green Team’s official name is The Greenspace Maintenance division. It will do the work that was previously performed by three city departments: Parks, Street, and Drainage. Placing all city grass cutting under one umbrella will make the management of these properties run more efficiently and economically. After many months of discussions on the need for a new division to manage these properties, The Green Team was formed with the hiring of two employees, one as the manager and the other a general laborer. These employees will join eight other current city employees to form the ten person team. Jeremy reports to City of Jeffersonville’s Director of Parks and Recreation, Paul Northam. “Most people may not realize that Jeffersonville maintains 29 parks (22 city parks, 6 specialty parks, 1 private park) as well as the marina, the trolleys, seven event facilities and other green spaces. With all maintenance now within one department, there will be no question regarding who is responsible and whom to call with questions and issues. 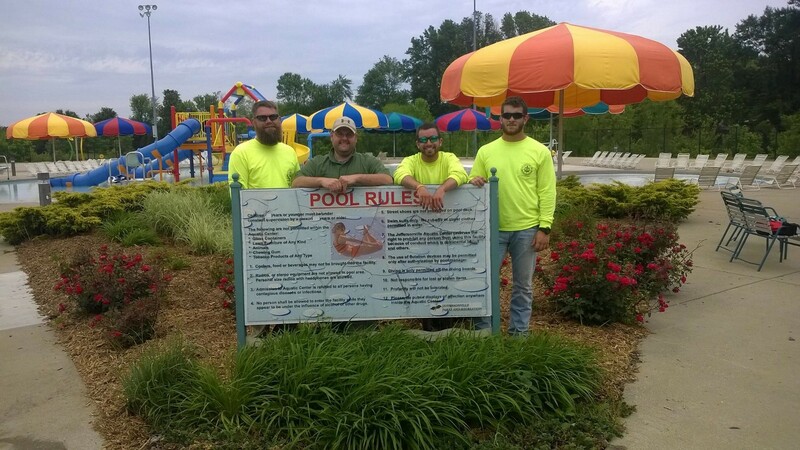 By hiring a qualified landscape maintenance professional, we will work diligently on making The City of Jeffersonville the best that it can be,” said Northam. Jeremy is very pleased to be able to continue to work for his hometown in this new role. “I’m from Jeffersonville so our city is both personally and professionally important to me. The Green Team will properly manage our green spaces and make them cleaner, prettier, more respectful and safe. 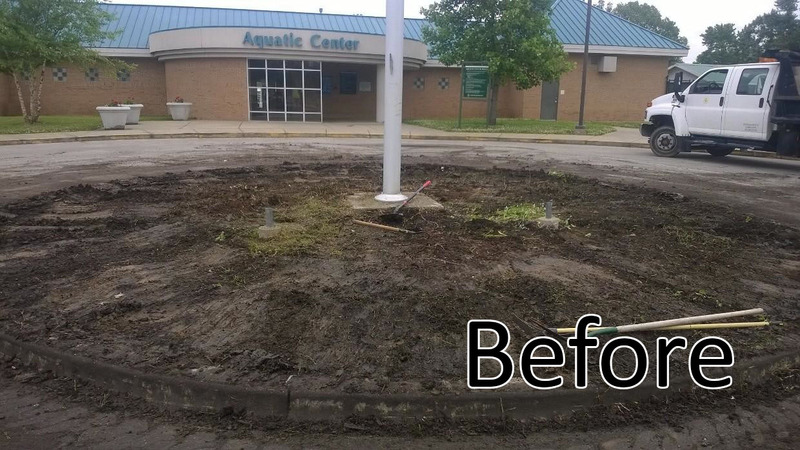 In the past two weeks, we have worked on Bob Hedge Park and the Aquatic Center. The ‘before’ and ‘after’ comparisons are impressive, if I may brag just a little on our team. Today we are working on the medians on 10th Street,” said Neff. Jeremy Neff has been a city employee since November of 2013, and prior to that, his previous experience includes Grounds Manager for the Town of Clarksville where he was responsible for landscaping, tree care, fertilizing, maintenance, mowing and grounds keeping for Brown Station Way, Lewis and Clark Parkway, Eastern Boulevard and Veterans Parkway. He also has prior experience as Grounds Manager for a 58-acre area in the heart of Clarksville neighboring Wooded View Golf Course.